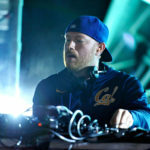 On Saturday, May 27, Eric Prydz debuted the breathtaking fifth iteration of his beloved Eric Prydz In Concert (EPIC) performance series following months of steep anticipation. Last year, EPIC 4.0 set an unprecedentedly high bar in terms of concert visual spectacles, however, 5.0 has managed to vault comfortably over its its predecessor. In a supercut from the show’s premiere at Creamfields’ Steel Yard, Prydz presents attendees’ perspectives of the shows, as they are engulfed by titanic, rotating double helix, mesmerized by a stunning galactic simulation, and loomed over by a sharply clear image of a satellite. And, of course, the cosmic hologram visual production would not be complete without a giant astronaut, entreating the crowd below to dance with fervor.